The specialty court you may not have known existed is helping vets across the country. Problem-solving courts take a specialized approach to working with participants in addressing the underlying problems that are contributing to their criminal behavior. It's become a big trend in the United States, as we've seen the emergence of drug courts and domestic violence courts that aim to reduce reoffenses and address substance use and other issues at the heart of illegal behavior. Similar to problem-solving courts, Veterans Treatment Courts (VTCs) have emerged as a type of specialty court that help address the underlying needs of veterans who wind up facing criminal charges. It's estimated that there are currently around 350 of these specialty courts across the country, and they differ in terms of how they run or what types of charges they adjudicate. But the overarching goal is the same: getting veterans the help they need to stay out of jail and reintegrate with society. A recent report by the Justice Programs Office (JPO) at American University's School of Public Affairs has found that VTCs are effectively providing former members of the armed forces with the support and services they need. Though the concept is still relatively new, it's spreading, and it's proving to be effective. Judge Robert Russell in Buffalo, New York, established the first VTC in 2008. Kim Ball, director of JPO at American University, spoke to Russell just after the court was established. "In a nutshell, Judge Russell saw the transformative power of military camaraderie when veterans on his staff assisted a veteran in one of his treatment courts," Ball says. "But he recognized that more can be done to ensure veterans are connected to benefits and treatment earned through military service." A big part of the problem was that many of these veterans were not connected to services, even though they were eligible for them through the VA. In Russell's court, a representative from the VA is included in the VTC team so that clients can immediately register for services and get help. And getting help is undoubtedly the most important part of the process. "The Department of Veterans Affairs and the Veterans Justice Outreach (VJO) officer play vital roles in the VTC model," Ball says. "Through coordination with a VJO officer, the VA provides treatment to participants. The VJO also coordinates with their respective courts to provide counseling services, job placement services, and housing. Research suggests that VJOs have been successful linking justice-involved veterans to VA services that treat their high rate of diagnosed substance use and mental health issues." Both of these are big concerns in the veteran community. According to a 2008 study by the RAND Center for Military Health Policy Research, nearly one-half million Iraq and Afghanistan veterans experience PTSD or depression. And more than 300,000 struggle with substance use. But VTCs help connect vets with services they need—all while providing a sense of "mission" that many participants say they believe they lost when they returned to civilian life. Julie Baldwin, PhD, a professor in the department of criminology for Missouri State University, says it is this sense of "mission" that separates VTCs from other specialty courts. Because of the military history that participants share—as well as a sense of "camaraderie" that comes with it—these courts often rely on those values in order to be successful. "Military ritualism is employed in many of these courts," Baldwin says. "You might see court begin with the color guard, hear service calls from the judge and participant, or see veterans receive their courts' challenge coin when they graduate from the program. These extra steps make the program more relatable to veterans and helps get their buy-in." There's no question that in order for the program to be effective, veterans must believe in the system and willingly participate in what's required of them; it seems that most do. Another way that VTCs help with the buy-in factor is by connecting them with mentors. The mentor program is a big key to VTCs success. Ball says that the incorporation of a peer mentor program to support participants is the most noteworthy facet of the VTC system, separating it from other specialty courts. Mentors may be active or retired military and are represented across all branches of the military. Georgia State Court Judge B.E. "Gene" Roberts is approaching his fourth year overseeing a VTC, which he says has been very effective—largely thanks to the mentoring program, in his opinion. Roberts says the mentors serve as sounding boards in many ways and allow the mentees to discuss things they wouldn't otherwise open up about. While he says they aim to pair mentees with mentors of the same branch—and ideally of the same time of service—it doesn't always work out that way. But Roberts says unlikely mentor/mentee assignments have often surprised him. "I have one young man who just completed two tours in Afghanistan, and he has taken on an 85-year-old Marine as his mentee," Roberts says. "They've paired off well—almost like a father/son relationship—and it's worked well despite the age gap." Ball says the model for VTCs is like the framework used for other treatment courts in that VTCs promote sobriety, recovery, and stability through a coordinated response. However, it is the incorporation of volunteer mentors and the coordination of treatment services that truly differentiate VTCs. Baldwin adds that the programs may be lengthier to complete, and there may be quite a few different facets involved in getting the veteran help. It may involve housing services, substance use treatment, VA benefits, and more. She says there are often quite a few agencies working together for a comprehensive solution that addresses all of the issues at hand. Having been in existence for less than 10 years, the entire concept of VTCs is new to many. While the objective of helping veterans to reintegrate into society is the end goal for all of these courts, how they get from point A to point B can vary dramatically. In fact, even eligibility rules governing qualification to participate in a VTC can vary from court to court. Baldwin says these courts can be extremely different from one another, and eligibility is one of the biggest factors that they vary on. While some courts will accept only veterans who have committed a nonviolent misdemeanor offense, there are others that will accept only certain felonies. Some courts might require a substance use disorder for a vet to be eligible, while others might require a diagnosis of PTSD. It can vary dramatically. Some courts will use only the VA as the service provider, so they require VA eligibility as part of their admission criteria. Tracy Velázquez, PhD, associate director of the JPO at American University, adds that each court sets its own rules for eligibility. Some of it has to do with what are dictated by the local rules and policies of a particular jurisdiction. She adds that participants in VTC are sometimes self-identified and that participation is voluntary. If a veteran declines to participate, he or she then goes through the traditional court process. Ball says that as VTCs have spread, so has the realization that there is no one-size-fits-all approach for veterans. There are many issues that can come into play and need to be addressed. Ball says this may be an area where social workers can play an important role in helping. Women veterans, in particular, may be survivors of military sexual trauma and may be uncomfortable—or even retraumatized—by participating with male counterparts in court activities. But Ball says social workers can play a role in assisting court personnel—who may not be aware of these types of issues or their impact—to understand and make necessary accommodations that help improve outcomes for veteran participants. There are other roles for social workers in VTCs as well. Some may have a leadership role in the court as the coordinator, Ball says. The coordinator is the one who ensures the smooth operation of the overall program, tracking progress of the participants and making sure all partners are on the same page. The VA also uses social workers as VJOs, and some courts have a case manager, who is often a social worker. Ball says it's becoming more common for probation officers to be social workers. "In fact, in some jurisdictions, a degree in social work is now required in order to be a probation officer," Ball says. "In VTCs where the probation officer is part of the team, there might be a social worker in that role as well." Social workers can also play an invaluable role if they have personal military experience or if they've worked with veterans before. "Just as having a veteran mentor is valuable, so is having other people on the VTC team who understand military culture," Velázquez adds. "Social workers who have been in the military or who have experience working with vets can help bridge the gap for civilians in the court who want to help but may not 'get' what it's like to have served." Though the concept of VTCs remains relatively new, it is proving to be successful. The Veterans Treatment Courts: 2015 Survey Results, compiled by JPO at American University, found that VTCs—true to their intent—are in fact providing veterans with access to much-needed services. More than 80% of the courts indicated that they were able to match participants with mentors who could provide assistance both in and out of the courtroom. More than 80% of the courts conducted random drug tests for those whose offenses involved substance use. More than 90% had developed policy and procedure manuals, formal mission and purpose statements, and clearly defined roles for those who were part of the VTC team. And finally, more than 90% say they share information with the VA in order to facilitate service delivery, usually through VJOs assigned to the court. The personal experiences of those involved in VTCs and the findings are equally powerful. Roberts says he has witnessed many transformative experiences of veterans who have gone through the program. He says that prior to the program, his typical participant had averaged 60 days in jail. After the program, that average dropped to five days in jail. That obviously equates to taxpayer savings. It's believed that VTCs may save taxpayers hundreds of thousands of dollars that would have otherwise been spent on incarceration. Since VTCs connect eligible participants to VA benefits, there are additional savings there as well. It ultimately offsets the costs that would have been incurred by local jurisdictions if participants were to be incarcerated and receive services through them. There are also benefits to the communities in which the veterans reside. Reducing the effects of criminal behaviors improves overall community well-being. Community members can rest assured that veterans in their area are receiving the help they need and becoming productive members of their local community. There's also a strong feel-good aspect when veterans are getting the help they need and not falling through the cracks. Baldwin says that because of this, community buy-in is typically easy to obtain. Once people understand the benefits of VTCs, they are usually on board with the concept. Everyone wants to see our nation's veterans receive the services they require to reintegrate into society. Roberts says that watching the life transformations has been incredibly rewarding for him personally. He has seen veterans reunited with their families and put back on their feet—as a result of going through a VTC instead of the regular court system. "My first three participants were all homeless," Roberts says. "When they graduated from the program, all three had a roof over their head that they were paying for themselves. They had gotten jobs and driver's licenses. It's very rewarding to watch veterans who have served our country straighten out their lives and get the help they need." Research shows that VTCs can have a big impact on vets. Though they are interspersed throughout the country, there are many jurisdictions that could benefit from a VTC. 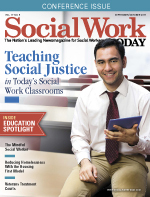 There may be a role for social workers in ensuring that they become more widespread. Ball says that social workers can help spread the word at conferences and even invite participants from VTCs in their state to come talk about the work they do. Furthermore, social workers who are part of VTCs can do a lot to spread the word. "Social workers who are part of VTCs can talk at Rotary Clubs and other civic groups about their court," Ball says. "Since in some jurisdictions judges often see themselves as more constrained in what types of public events they can participate in, social workers can really fill in that gap. They can share the challenges they see veterans facing every day."